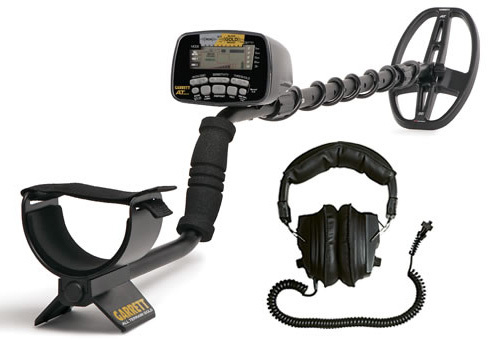 Garrett AT Gold Metal Detector & Headphones #1140680 - ADD FREE SHIPPING! If you want a powerful gold prospecting machine that doubles as an impressive collector of coins, relics, and jewelry, you want the Garrett AT Gold Metal Detector with deep-seeking, true All-Metal Mode performance for all terrain prospecting! The AT Gold metal detector comes with a 5 x 8 inch DD search coil and factory headphones and was designed to find tiny gold nuggets in the most challenging prospecting environments, including shallow fresh water hunting (waterproof to a maximum depth of 10 feet for searching in freshwater lakes and streams). 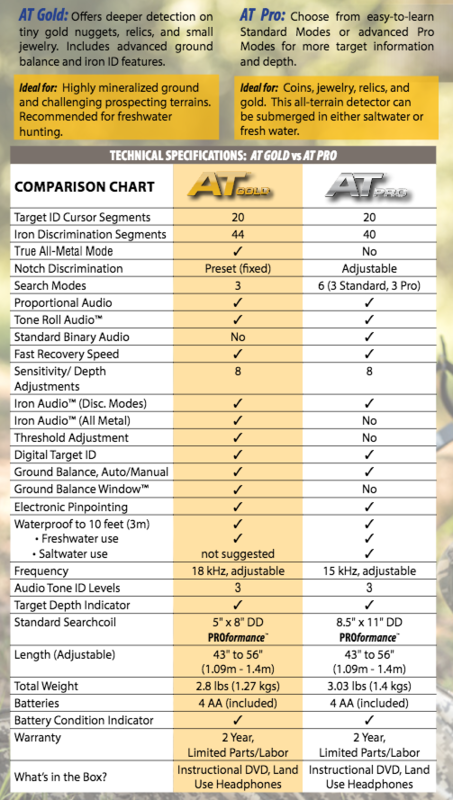 The AT Gold operates at a high frequency -- 18 kHz -- optimized for gold prospecting and includes a True All Metal Mode. The All Metal Mode is preferred for prospecting because it provides the greatest possible depth and sensitivity. It also provides a continuous audio response to allow the operator to hear the subtle detection signals produced by faint targets. The AT Gold is a Motion All Metal detector, meaning that slight motion of the search coil is required to maintain detection, although static detection of targets can be achieved while in Pinpoint mode. Scroll down to read the Field Test Review by Gary Sturgill, GPAA Chapters/Trade Show Manager. The Garrett AT Gold metal detector includes 18kHz frequency for enhanced detection of small gold nuggets, jewelry, coins, and relics. It is highly recommended for Prospecting, Coin Shooting, Hunting for Jewelry, Caches, Relic Hunting, Organized Hunts and Shallow Fresh Water Hunting, too! HIGH-RESOLUTIONI IRON DISCRIMINATION: Provides 40 points of iron resolution—controlled with touchpads and viewed as a digital number on the LCD—for the most precise ability to separate a good target from iron trash. IRON AUDIO: Allows user to hear discriminated iron and to audibly identify problematic flat iron objects like bottle caps and washers. ALL-METAL IRON AUDIO: A Garrett exclusive feature that allows user to audibly identify iron objects even while operating in a True All Metal Mode. GROUND BALANCE (MANUAL): Allows the user to manually adjust the detector's ground balance to reduce the detrimental effects of ground mineralization. FAST TRACK GROUND BALANCE: Automatic feature that allows user to quickly ground balance the detector in mineralized soil conditions. ELECTRONIC PINPOINTING: This Non-Motion All-Metal Mode is used to precisely locate a detected target's location in the ground. Total Weight - 3.03 lbs. Garrett Master Sound Headphones model 2202400: Field tested for quality. You'll be able to find more treasure with the wide dynamic audio range speakers that enhance weak signals, have dual controls for adjusting and tuning return signals to suit your individual hearing requirements. Comfortable ear cushions and adjustable headband guarantee a comfortable fit for every head size. Good wide area of operation; 8 ohms per channel speaker impedance, frequency response: 30-18,000 Hz. A full length 10 foot reinforced coiled cord with the most IMPORTANT feature; .25 inch right angle stereo phone plug! Download the Garrett AT Gold Metal Detector Operating Manual here. "... The AT Gold is a VLF detector with 3 search modes. It comes with a True All Metal Mode. This provides the greatest possible depth and sensitivity. It also provides a continuous audio response, allowing you to hear the subtle detection signals made by faint targets. I used the all metal mode at the beach with good results. I found numerous AA batteries, a few clad coins, a lot of soda can tabs, part of a wedding ring set, and an old spoon. It has 2 discrimination modes. This makes it a versatile coin and relic hunting machine. By selecting either the DISC 1 or DISC 2 modes, you gain more tone ID info. from your targets and are able to discriminate unwanted trash targets such as foil, nails, pull tabs and old spoons. Garrett AT Gold detector has 8 sensitivity settings that you can change on the fly with the push button controls. Use the (+) or (-) buttons to work through the 8 levels that are continuously shown on the LCD screen. You will want to use the higher sensitivity levels for finding extremely small or very deep targets. Lower levels should be used to help erratic operation due to the presence of highly mineralized ground or electrical interference from other detectors that may be using an unshielded coil. This lightweight unit (2.8 pounds) has on the fly pushbutton controls as well as Auto and Manual Ground Balance. The exclusive Ground Balance Window feature optimizes the machine's performance in highly mineralized soil, where gold is often found. It comes with standard headphones that are quite comfortable, and have a waterproof connection as this machine is totally submersible in fresh water up to 10 feet. Because the AT Gold is optimized to find small gold, saltwater use is not recommended. Its ability to find small gold is equally relative to the conductivity of saltwater. It does, however, do quite well in dry sandy conditions for coins and jewelry. I really liked the easy-to-see LCD screen. Across the top is the Target ID Legend and directly under it is the Target ID Cursor that indicates the targets probable identity. The depth indicator displays are tagged with a Target ID number. This is a more precise version of the ID Cursor. It also shows at a glance what mode you are in and current battery levels. The Electronic Pinpointing feature works like a charm. I was able to dig a small target without having to widen my hole in the search. This Non-Motion All Metal Mode is used to precisely locate a target's location in the ground. The Garrett AT Gold metal detector operates at 18 kHz, making it a great machine for small gold. It has 3 Audio Tone ID Levels and is adjustable from 43.25 inches to 56.25 inches. You get lots of extras thrown in the box, making it a great value! After using this detector, I can see the others that I own getting a nice rest for a while. The Garrett AT Gold has quickly become my choice metal detector when I want to grab one and go find whatever treasure awaits me next." Gary Sturgill is an experienced prospector and the Chapters and Trade Show Manager for GPAA (Gold Prospectors Association of America).